A pioneer in electronic video displays for over 13 years. We have installations around the world and in Central and South America. Our projection scoreboard uses special software, a unique projection system with our design projection screen. Software for indoor sports scoreboards. Basketball scoreboard, soccer scoreboard, hockey scoreboard, volleyball scoreboard, swimming scoreboard and track and field scoreboards. Software runs on windows based platform. Projection system-- Use your projector or purchase ours. You will need a higher than average lumens projector. We recommend 4500 lumens. This is totally dependent on existing ambient lighting conditions. Because we have the highest gain screens in the industry we product the best quality and brightest sports projections. Sponsor Panels--Color Logo... Change logo on the fly Scoreboard Sponsor panels scrolling message display can added and changed on the fly. 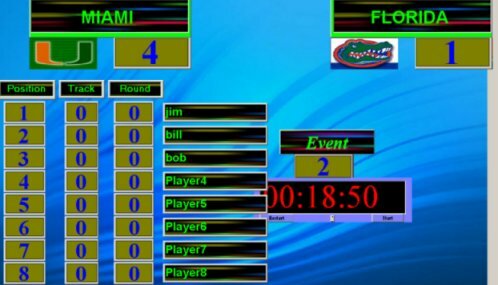 Full Motion Video Scoreboard--Capability to show live video as well as pre-recorded video League associations, Church leagues, schools, league games not able to afford a full size LED scoreboard can now have a projection scoreboard. Many leagues have their own projector systems. Use our customizable software and you are ready to start playing. Dimensions:76"high x 96" wide x 3 mm" deep.